The holiday season is around the bend, over the river, and through the woods. Time for giving & receiving, being thankful, singing carols. Would that we people of Earth might spend every day in the holiday spirit! Forget war. Be kind. Trade more money for more time with our family. Remember our manners. It sounds so simple—and it is—but it does require a new perspective. 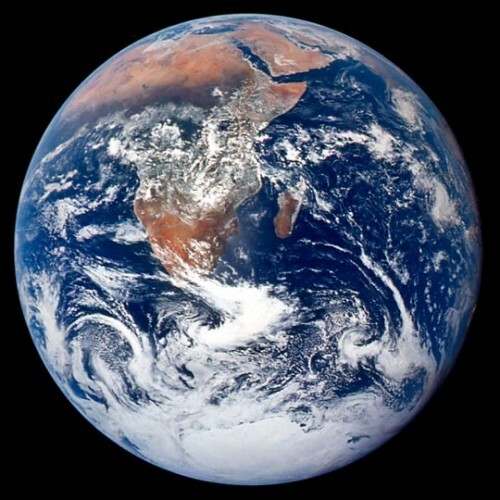 From the perspective of space, our home is a beautiful Blue Marble. This stunning photograph was taken by American astronauts during NASA’s Apollo 17 lunar mission in December 1972. What if every one of us could take a trip on a spaceship and look back at this amazing orb we call home? We would return to Earth fully prepared to celebrate Earth Day, Thanksgiving Day, Christmastide, and New Year’s every day, year in and year out! We would be motivated to express our profound gratitude. As David Archuleta recently quoted from a Yogi Tea proverb, “An attitude of gratitude brings opportunity.” True gratefulness comes from knowledge and awareness of our humble existence. As we land safely back on Earth from our imaginary space trip, we find that many Earthlings have been listening to Christmas carols, even before Halloween. Has the world turned upside down!? Well, not exactly. Thanksgiving comes before Christmas this year, as with every year, but we fans of David Archuleta have been joyfully listening to Christmas songs from his debut holiday album. Christmas from the Heart is a collection of 13 songs, including familiar English, French, and Spanish carols, a couple of popular tunes, and an original song entitled “Melodies of Christmas.” From my wider perspective, it has seemed perfectly normal to be listening to “Ave Maria” and “O Come all Ye Faithful” in October! “An attitude of gratitude brings opportunity,” and we very grateful fans have used every opportunity to hear David sing these carols. And you can be sure we will gratefully fill many Christmas stockings with David’s holiday CD. Give Christmas from the Heart to your nearest and dearest. They will be forever grateful! As you count your blessings, here’s another thing to add to the long list…Music! Now make a beeline to last week’s “Type Bee”. Catch you next week! This was a great post and I think this is a great place for me to say how much I appreciate all the Bee bloggers. You are all wonderful. I love reading your posts even though many times I read them days later and don’t post a response. It is very evident that you put a lot of time and effort into your blogs and I hope you never feel unappreciated. Thank you for spreading such great buzz for David. Thank you, kimbee! Your kind words are much appreciated. We Honeybees do work hard–it’s a ‘labor of love’ for all of us fans of David! Glad you visit us often and help create more sweet buzz.